features interesting route guides - with maps and GPS coordinates. This is no corporately produced, rehashed holiday guide, it’s a book that’s grown from hundreds of Chris Scott’s journeys and his passion for a part of the world that is like no other. Even 5 stars doesn't do it justice. The godfather of overland and desert exploration, author of Adventure Motorcycling Handbook and other respected adventure manuals, former courier Chris Scott knows more about riding in the desert than any Englishman since T E Lawrence. very useful and inspiring for the serious adventure rider. If you're thinking of going to Morocco, on your own bike or a fly-hire trip, soak this up first. this is the book to buy. Now in its 3rd edition and in full colour, Morocco Overland is a route guide to exploring southern Morocco’s spectacular landscapes ­­­– from the snow-clad High Atlas to the dunes of the Saharan fringe and right down into the Western Sahara. With easy-to-follow routes ranging from sub-alpine trails to arid canyons winding past hidden Berber villages, and from the Atlantic surf to former Dakar Rally pistes, this comprehensive route and planning guide will appeal to both first timers and the seasoned adventurer. For 4x4s, 2WDs, motorcycles & mountain bikes Expert guidance on the choice and preparation of 4x4s, 2WDs, motorcycles and mountain bikes, plus off-roading techniques. 65 routes covering nearly 12,000km Includes off-road routes for 4x4s, motorcycles and mountain bikes as well as scenic byways suitable for all vehicles including campervans. Route guides with downloadable GPS waypoints Each route is graded for suitability for big motorcycles and mountain bikes. Includes fuel stations, and selected restaurants and places to stay. 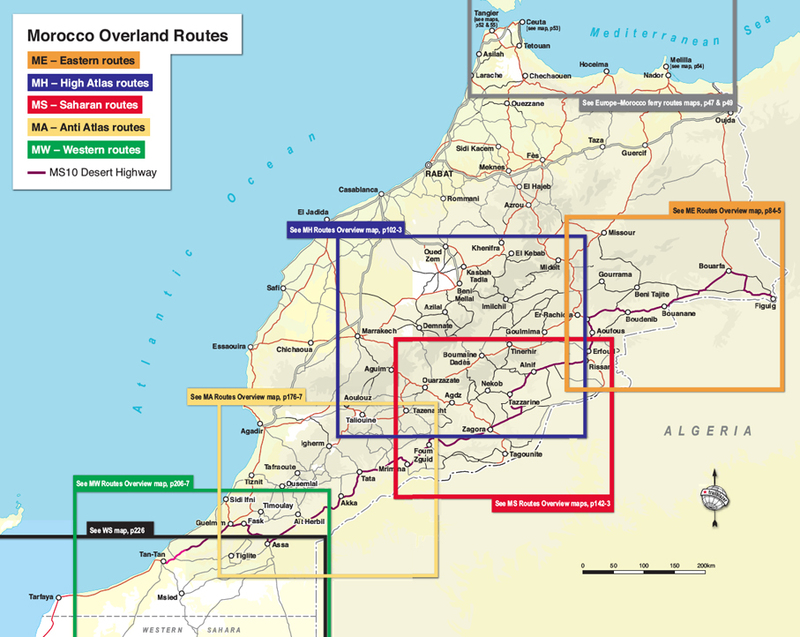 Getting to Morocco Cross-country routes, ferries, immigration procedures and port maps; fly-drive for 4x4 and bike rentals.